It is a well-established fact that quizzes are fun, especially Magic quizzes! If you’re exceedingly lucky, you had the chance to experience the world-renowned Rich Hagon Game Show, and I’m sure you’d have had a good time there. But what if you want to develop and run your own Magic-based quiz, either for other judges or for other players? Fortunately, this guide will give you a rundown on some guidelines if you want to take on the daunting task of creating your own quiz event. The first, and perhaps the most important detail is to consider your audience when deciding the difficulty of the overall quiz. For example, is this quiz aimed at your local group of players, all of whom have been playing for the last twenty years and can name every card from the Mercadian Masques block? 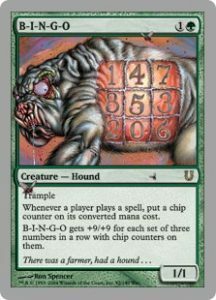 Or is it aimed at a Prerelease crowd, which might consist of players only barely familiar with the last year of cards? In either case, you want to try and tailor the difficulty of the quiz for the appropriate level. The ideal structure of a quiz should result in a spread of success among players. To achieve this, questions of varying levels of difficulty should be included. If you’re not sure where to set the challenge, a good hedge is to assume most players who attend a quiz have been playing in the 1-2 year range. Design the quiz with this in mind, and include a few questions aimed at the more long-term players. 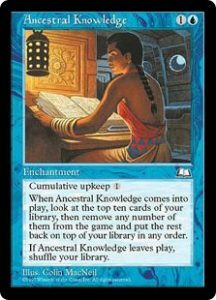 The major implication of this is to base many of your specific questions on cards in Standard, especially if knowing the rules text of these cards is important! Obviously, all these aspects are subject to change, but I’m going to lay out the structure of the quizzes I have run in the past at judge conferences. Quizzes should run for about an hour, with five distinct rounds, finishing with a quick-fire round to determine an overall winner. Teams are divided into groups of roughly four contestants, and the preferred method I’ve found is to use WER, enrolling each team into a casual event and pairing them automatically. At the end of the round, the pairings then compare their scores, with a win, loss or draw occurring. “But Sean!” I hear you cry, “I don’t know what sort of stuff to write a quiz about!” I hear you, convenient writing device- I’ll offer some examples of rounds I’ve written or co-written in the past, and I’ll even include a few questions at the end to test your mettle. I tend to start each quiz with a picture round, normally showing a small part of the art of some Standard-legal cards, and asking players to identify them. This is a great option, partly because it’s quite easy to vary the difficulty (Kozilek’s crown is easier to figure out than a small patch of Saddleback Lagac), but also because the paper with the questions can be passed out whilst your participants are getting settled. I’d recommend trying to make most of these questions; focus on cards that are regularly played in Standard, but including a Hundred-Handed One here or there never hurt anyone. Next, I will up the difficulty with a flavour text round (some participants aren’t a huge fan, but some absolutely love them). Questions from this round entail asking players to match flavour text with their respective cards. 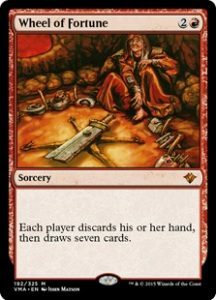 If you’re feeling particularly mean, ask them to write the flavour text of given cards! One other successful type of quiz has been a spelling round (David Lyford-Smith is a monster), naming the current top 25 players in order, and naming the players in a top eight of a particular event. If you’re feeling particularly adventurous, a Magic general knowledge quiz is always fun, although a little arduous to put together! My final observation is that in keeping with tournament tradition, it’s quite fun to have the top 4 contestants battle it out for first place. The current tried-and-tested method is a quick-fire round. A category is chosen and each team’s ‘champion’ must, in turn, name a card that belongs to said category. Those who hesitate, deviate or repeat are eliminated from the running. Examples of categories include: legendary three colour creatures, creature types, and dragons. It sounds easy, but with pressure it becomes a lot harder! As a final point, remember that the emphasis on these events is for it to be fun. If no-one has any idea of the power and toughness of a Guardian Beast, or what the third word of flavour text on Reparations is, don’t make those questions part of your quiz!